The following excerpt came from a weathered old tome I found on the shelf of a tiny bookshop in Edinburgh. Both the bookshop and the street where it resided have long since vanished, and all attempts to find either have proven fruitless. Thankfully, I was so puzzled by the following passage that I made note of it. You may question, as I had, if the following is fiction or a prank, but the odd…qualities of the original manuscript convinced me of its truths. The book itself held declarations of another realm; a place called the Grimwytch. 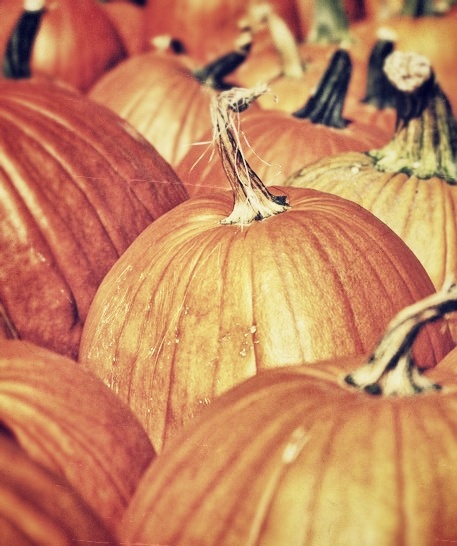 A land where a monstrous people seek to protect themselves from humans on Halloween night. Or Narroweve as they call it. It is a singularly strange fact that human beings, or Drearspawn as most of us more accurately call them, are absolutely terrified of Narroweve. On this night, which they call Halloween, they wear costumes that make a mockery of us denizens of the Grimwytch. Ironically, the purpose of this is a wretched attempt to fend off the very same spirits we too seek to be free of on this night. But alas, human beings tend to wander like lost sheep on Narroweve and from time to time they slip through the veil into the Grimwytch. And from there cause all manner of havoc, disturb the peace with their perpetual screams and gibbers, and even go as far as to attack our citizens. So here, for your consideration, are five ways to repel humans. Pure Essence of Fear is both difficult and expensive to acquire. Fortunately there are merchants, particularly in the market on the Vashhaal wharf, who can procure such things. So if your funds are plentiful, Essence of Fear will make a most effective remedy to repel humans. Simply spray it into their ears, allow it to spread and creep, and their fevered minds will take care of the rest. While Lumpathumps are difficult to find on account of being invisible, you should be able to lure them using fried rat tails or copper pennies. Lumpathumps make perfect deterrents and are especially effective in warding off young humans. This is due to their propensity for hiding beneath beds, as well as the fearsome noises they make when threatened by a din of snoring. Oddly, spiders are a very common fear for Drearspawn. Why these friendly and articulate pets bother human beings is certainly beyond this writer’s comprehension. And whilst I’d never condone frightening a spider with a human, needs must as the drivel drives. As there are spiders, so there are flies. And the almost indescribable stench of a Cheesedung fly, especially one gathered at dusk, is enough to deter even the angriest of Hoardspikes let alone a Drearspawn. Needless to say coating oneself in a scent so vile should be a last measure as the wearer can expect to carry this most noxious scent for the rest of their life. Or lives. While it should be noted this author has little regard for Drearspawn, I do not mean them harm. I only wish they’d leave us in peace and that our citizens would stop opening the portals between our worlds. But if a human is armed and intent on causing mischief, then let the Hackthins at them. And whatever’s left will almost certainly make a most pleasant purse or scarf. So now you have five means to repel humans. Although removal and disposal of them is another problem entirely. See chapter five for more on this troublesome topic. After noting this intriguing passage, I discovered a so-called novel by a writer called Eldritch Black titled ‘The Book of Kindly Deaths’. This rather strange author has portrayed the Grimwytch as fiction in his book of very curious stories, but it’s quite clear to me that the monsters he chose to write about are terrifyingly real. 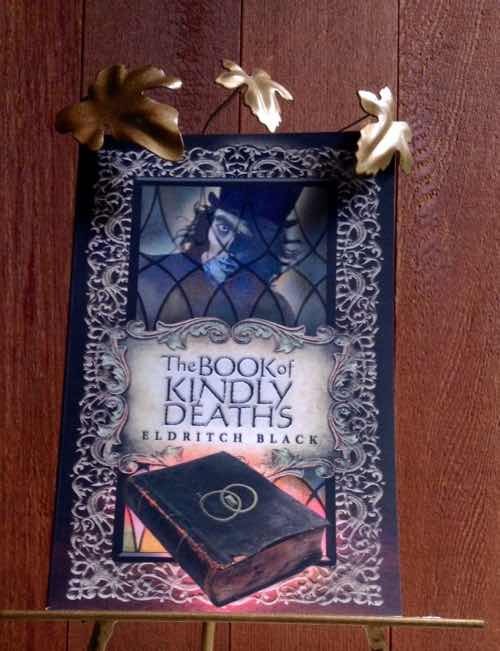 You can win a copy of The Book of Kindly Deaths on Goodreads from now until November 9th 2015, and read a lost tale from the book here. 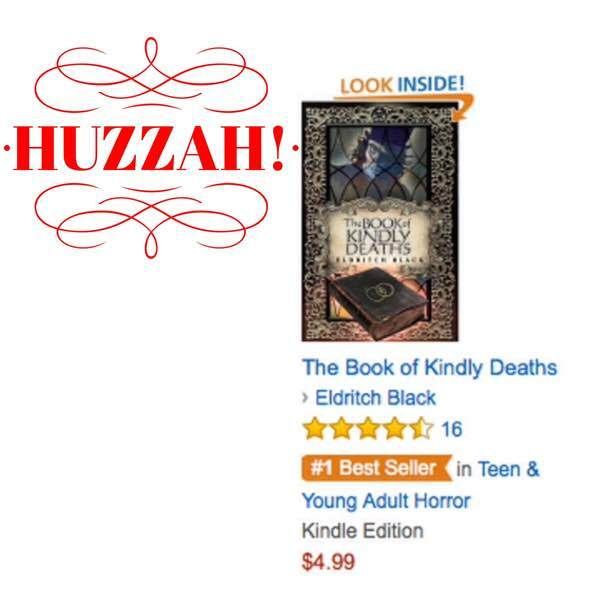 The Book of Kindly Deaths in the Amazon Top 100! There has been cause for celebration here in my woodland lair. Crows have cawed, bats have blazed through the air and frogs have croaked in the fog. As mentioned in yesterday’s post, The Book of Kindly Deaths has been featured in Amazon’s Daily Deal. Cue constant refreshing of my Internet browser as I watched it climb the Amazon Sales Rank…until my head felt like it was full of tiny fish, and my eyes were pebbles. I woke today to find the book in the Amazon Top 100, which was a perfect way to start the day! Naturally, I’m over the moon in a top-hat shaped balloon, and writing this post from somewhere near Jupiter. I’m also incredibly grateful for all the lovely people who purchased the book, tweeted and shared it, and left many wonderful reviews. 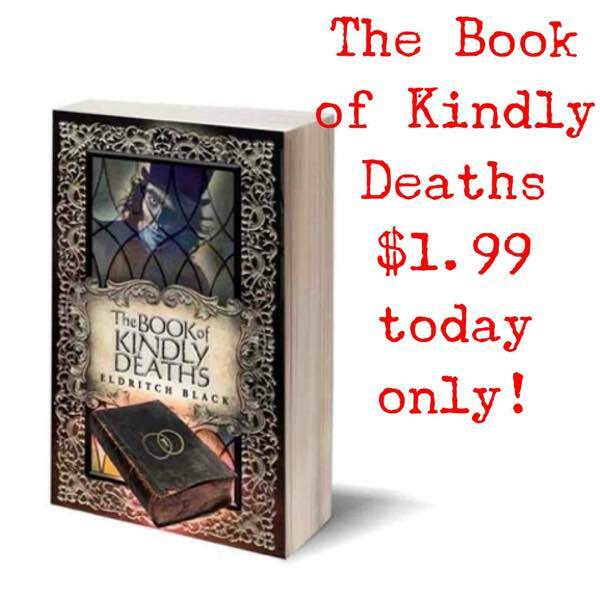 The Book of Kindly Deaths Amazon Daily Deal! Do you ever wonder where monsters come from? You should…because it’s best to know where they are at all times. That way you can avoid them. And now you can, for The Book of Kindly Deaths documents the eerie and strange lands of the Grimwytch. And today, you can buy this dreadful, fantastical story and guide to the realm of monsters at a reduced price. For one monstrous day only! 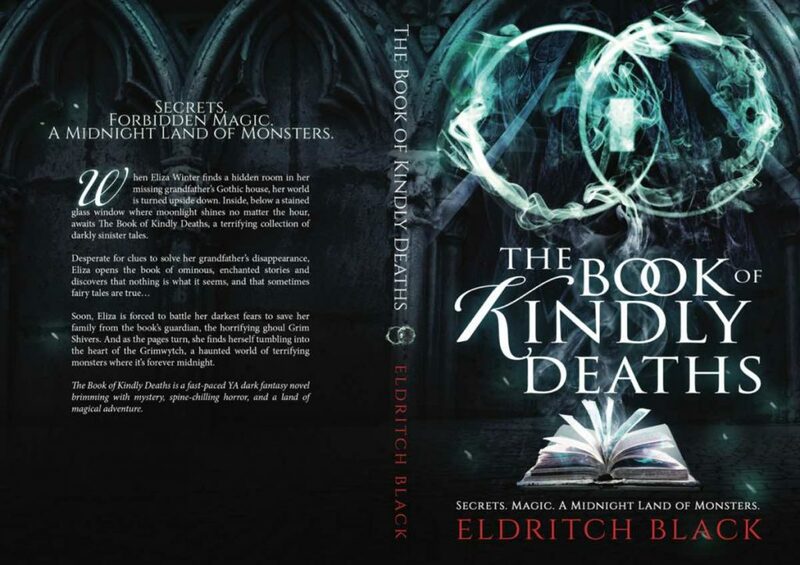 The Book of Kindly Deaths Giveaway! Moving on from dark antics, I’ve been hard at work over the winter. A new novel is almost finished and another two are being planned. So expect to see some new work soon! 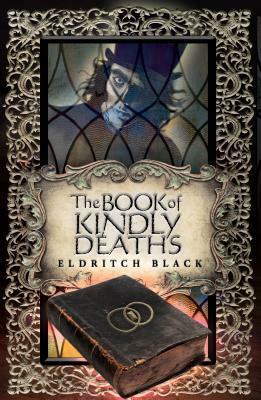 But for now, I wanted to let you know you can win a signed copy of The Book of Kindly Deaths simply by registering for the giveaway below. Giveaway ends April 06, 2015. Even though The Book of Kindly Deaths has been available for a couple of months now, I still get an immense thrill from seeing it in real-life book shops. Including Local Grown, the very place I wrote a great deal of the novel in. Local Grown’s a coffee shop situated on the island where I live. Yes, a writer writing a book in a coffee shop, who would have thought it? The coffee shop is situated on a pier which overlooks a cove. There’s really nothing better than gazing through the window across the waters when stuck on the odd passage of writing. Beyond the glare of the screen is the calming ebb and flow of the water. At least on the surface, for who knows what tentacled horrors lurk below. I try not to think about them too much, for fear any directed attention might summon them up from the water. Strange things happen there from time to time. Perhaps it’s the collective imaginations of all us caffeinated writers at work. Warping reality. On one occasion, it seemed very much as if a character from one of my new novels actually came into the shop to buy a coffee. Yes, it probably wasn’t actually him, and yet it was a very close facsimile and not a pleasant experience. Because that character was as bad as bad can be. 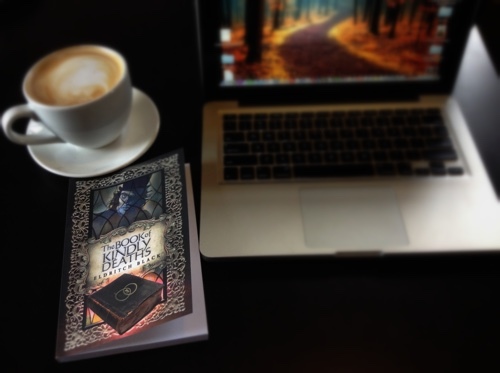 For now, I thought I’d share a couple of pictures of the novel out in the wild, as well as a passage from the very beginning of The Book of Kindly Deaths. I hope you enjoy it. And finally, I’m planning on updating ‘The Occasional Blog’ more often in 2015, as I have a number of exciting things planned. It was a thick volume with a worn and cracked black cover showing a gold symbol, a rectangle within two circles that sparkled and flickered as if teased by ghostly fingers. Voices whispered from inside the book, growing in volume, a few human, a few not. As their distant howls and cries grew, the book rocked with such force that it flew into the air and hovered. When it thumped back onto the desk, the thick fountain pen next to it leapt into the air like a small brass salmon. As it clattered down upon the desk, a spark shot from the pen’s nib, playing over the book and sending its pages flying open. One by one, the pages flipped, faster and faster, an animated blur of neat blue writing seeming to jump with the book as its dusty pages turned. Beyond the room with the book and the stained glass window, the room that had no business being there, the dark, sprawling house was silent. Like a cat, tensed and still and waiting for its prey to make a move.